A diving regulator is a device that reduces the high pressure in a diving cylinder to the same pressure as the scuba diver's surroundings. The breathing performance of regulators is a factor in choosing a suitable regulator for the type of diving to be undertaken, as it indicates the ability of a regulator to meet the demands placed on it at depth and under high breathing loads. It is desirable that breathing from a regulator requires low effort even when supplying large amounts of air. It is also recommended that it breathe smoothly without any sudden changes in resistance while inhaling or exhaling. Although these factors may be judged subjectively, it is convenient to have a standard by which the many different types and manufactures of regulators may be compared. Various breathing machines have been developed and used for assessment of breathing apparatus performance. Ansti Test Systems developed a turnkey system that measures the inhalation and exhalation effort in using a regulator. Publishing results of the performance of regulators in the ANSTI test machine has resulted in performance improvements. The ANSTI Breathing Simulator is rated to a maximum working pressure of 100 msw. It uses a piston mechanism to provide an accurate and repeatable volume displacement with a sine wave drive mechanism. It has adjustable tidal volume and breathing rate settings which can providing ventilation rates from 10 to 180 litres per minute. In the European Union the standard EN250:2000 Respiratory equipment. Open-circuit self-contained compressed air diving apparatus. Requirements, testing, marking defines minimum performance standards for "Open-circuit self-contained compressed air diving apparatus". Although a regulator meeting the above limits will supply sufficient air where the first stage feeds a single second stage, it is not necessarily capable of supplying sufficient air in all circumstances when a single first stage feeds two second stages simultaneously. In Europe, EN 250: 2014 – Respiratory Equipment – Open Circuit Self - Contained Compressed Air Diving Apparatus – Requirements, Testing and Marking defines the minimum requirements for breathing performance of regulators, and BS 8547:2016 defines requirements for demand regulators to be used at depths exceeding 50m. EN 13949: 2003 – Respiratory Equipment – Open Circuit Self-Contained Diving Apparatus for use with Compressed Nitrox and Oxygen – Requirements, Testing, Marking. defines requirements for regulators to be used with raised levels of oxygen. EN 15333 – 1: 2008 COR 2009 – Respiratory Equipment – Open-Circuit Umbilical Supplied Compressed Gas Diving Apparatus – Part 1: Demand Apparatus. and EN 15333 – 2: 2009 – Respiratory Equipment – Open-Circuit Umbilical Supplied Compressed Gas Diving Apparatus – Part 2: Free Flow Apparatus. I.S. EN 14143: 2013 – Respiratory Equipment – Self-Contained Re-Breathing Diving Apparatus defines minimum requirements for rebreathers. In the United States Military, the standard for single-hose scuba regulators was MIl-R-24169B, now withdrawn. ↑ Reimers, S. D. (1973). 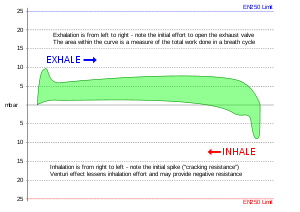 "Performance Characteristics and Basic Design Features of a Breathing Machine for Use to Depths of up to 3000 Feet of Sea Water.". US Naval Experimental Diving Unit Technical Report. NEDU-20-73. Retrieved 2008-06-12. ↑ "Demand Regulator Test Station". Ansti Test Systems Ltd. 2003-06-19. Retrieved 2009-09-14. ↑ "The ANSTI Machine: Evaluating A Regulator's Breathing Characteristics - Scuba Diving Magazine". ↑ staff. "Life Support Equipment Test Facility" (PDF). Retrieved 18 November 2016. ↑ Anthony, T G; Fisher, A. S.; Gould, R. J. "HSE publishes research on performance of 'octopus' regulators for scuba diving" (PDF). Research Report 341. Norwich, UK: HMSO. ISBN 0 7176 6101 6. Retrieved 18 November 2016. 1 2 3 4 Staff (August 2014). 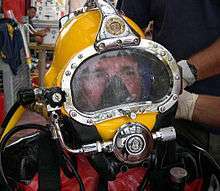 "Diving Breathing Apparatus" (PDF). Diving Standards. Dublin: Health and Safety Authority. Retrieved 18 November 2016. ↑ Committee PH/4/7 (31 March 2016). BS 8547:2016 - Respiratory equipment. Breathing gas demand regulator used for diving to depths greater than 50 metres. Requirements and test methods. London: British Standards Institute. ISBN 978 0 580 89213 4. ↑ Middleton, JR (1980). "Evaluation of Commercially Available Open Circuit Scuba Regulators.". US Naval Experimental Diving Unit Technical Report. NEDU-2-80. Retrieved 2008-06-12. ↑ Morson, P. D. (1987). "Evaluation of Commercially Available Open Circuit Scuba Regulators.". US Naval Experimental Diving Unit Technical Report. NEDU-8-87. Retrieved 2008-06-12. 1 2 Warkander, D. E. (2007). "Comprehensive Performance Limits for Divers' Underwater Breathing Gear: Consequences of Adopting Diver-Focused Limits.". US Naval Experimental Diving Unit Technical Report. NEDU-TR-07-02. Retrieved 2008-06-12. ↑ Staff (22 February 1982). "MIL-R-24169 › Regulator, Air Demand, Single Hose, Diver S". US Department of Defence. Retrieved 27 November 2016.